There's something delightfully old-fashioned and comforting about hydrangeas. With their lovely neat mounds of lush green leaves, topped by clusters of little buds that grow plumper by the day, they are a highlight in semi-shaded situations from now through to the end of summer. In full bloom, the large, striking flower heads in shades of blue, purple, pink, cerise and white are just gorgeous. The foliage too is lovely - large, dark green oval leaves, often with serrated edges. The lushness of the foliage and the mostly cool tones of the flowers have a soothing effect in a summer garden. 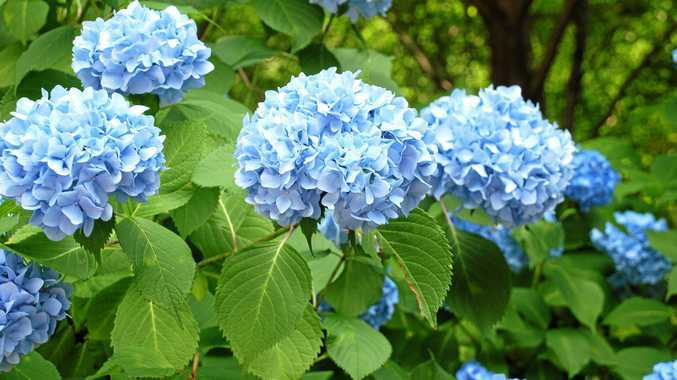 Hydrangeas are an easy-care, fast-growing deciduous shrub to 1-3m. Flower colour is somewhat variable according to soil conditions. Acidic soils will generally produce blue flowers, whereas alkaline soils will produce pinker flowers. White varieties tend to remain so, although may be tinged with blue or pink depending on the soil. You can influence the flower colour if you want, adding hydrangea pinking tonic or lime to push the flower colour towards the pink end of the spectrum, or hydrangea blueing tonic to go the other way. The newer named varieties are pretty true to colour, given a neutral soil pH. Hydrangeas are long-lived and easy to grow. The ideal position is partly shaded, protected from strong winds and hot sun. Not too shady, though, or you will have beautiful leaves and few flowers. They grow well in our sub-tropical climate. You'll need moist, well-drained soil enriched with plenty of organic matter. Use water crystals when you plant, and keep the plants well mulched. They look spectacular in pots, but keep them really well watered. Prune after flowering, around March or April, and remove any old or dead wood. Don't prune too hard, though, and leave stems that haven't flowered as they may do so next year.